For Matt Collins, the journey to becoming a craftsman had unique origins. Matt has always loved music and rhythm in particular. He began his journey by learning to play drums and starting his own bands. In 1989 Matt visited the Laguna Beach Sawdust Festival and walked into a booth of exotic hand made percussion instruments. The beauty and craftsmanship of the instruments awoke an idea or realization of what he would most like to become. Matt's next step was becoming an apprentice. After spending four years learning to make South American and African percussion instruments Matt opened his own company. Five years into this new endeavor he had an idea to create a new instrument that would combine the African box "slit drum" with a wood turned body. His quest to bring this idea to life led him the the Glendale Woodturners Guild where he learned the rudiments of wood turning. Matt now makes beautiful wood turned slit drums and has developed a passion creating lathe turned vases and bowls. As Matt continues to pursue his artistic vision, he draws inspiration from ceramics, art deco works, Japanese and African art. This growing vision overflows into forms and new ideas for turnings and instruments that fill his sketch books. The forms he creates are classic and elegant, while at the same time excitingly new and whimsical. Matt is an active artist at the Sawdust Festival in Laguna Beach. He lectures and demonstrates his instruments and art in Southern California schools. Many professional percussionists own and play his instruments. 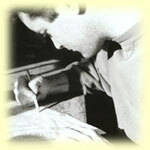 He is a member of the Glendale Woodturners Guild, American Association of Woodturners, and The American Craft Council. Fiesta de las Artes - Redondo Beach. 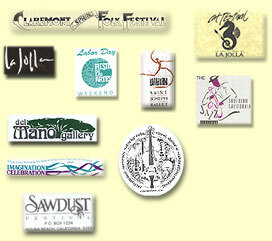 Claremont - Folk Music and Craft Shows. Various galleries and craft shops.